Dr. Seth Golden has been practicing podiatry in private practice since completing a combined two-year residency program in podiatric orthopedics and surgery in 1997. He graduated from SUNY Albany in 1991 with a BS in Biology and from the New York College of Podiatric Medicine in 1995. He is Board Certified by the American Board of Podiatric Orthopedics and Primary Podiatric Medicine and is a Fellow of the American College of Foot and Ankle Orthopedics and Medicine. 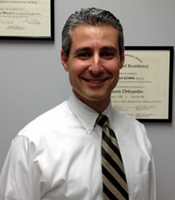 During Dr. Golden's education and time in practice, he has had the opportunity to recognize and treat a diverse array of conditions affecting the feet and lower extremities. He takes the time necessary to ensure all patients feel comfortable, to listen to their concerns and provide a careful, thorough examination. He will not hesitate to coordinate care with other members of a patient's healthcare team in order to provide the highest level of care. Whenever possible, Dr. Golden prefers a conservative approach, which is individualized for each patient's needs. His patients are thoroughly educated to assist in treating both current conditions and proactive measures to prevent new conditions from arising. A multidisciplinary approach is utilized when necessary. His goal is to improve, maintain, or return his patients' to their optimal level of activity as quickly and safely as possible. Dr. Golden enjoys practicing his profession, spending time with his family, running and exercising.